The maximum capacity of the compressor in a well designed systems always exceed the maximum mean air consumption of the system (maximum mean air consumption is the mean air consumption over some reasonable time). 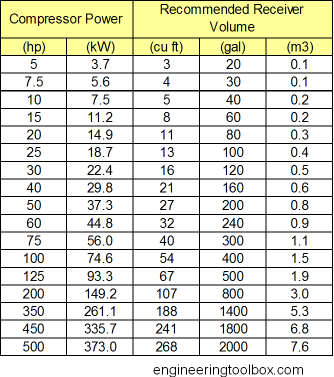 Since the maximum capacity of an air compressor also always exceed the minimum air consumption in the system - the compressor must modulate its capacity during normal work, often by using primitive strategies as on/off modulating or more advanced strategies as frequency drives and inverters. Primitive modulating strategies cause more pressure variations in compressed air systems than more advanced strategies. In addition, the air consumption vary due to the process supported. In shorter periods the demand for compressed air may even exceed the maximum capacity of the compressor. In fact, it is common in well designed systems not to design the compressor for the maximum peek loads. depending on the system. 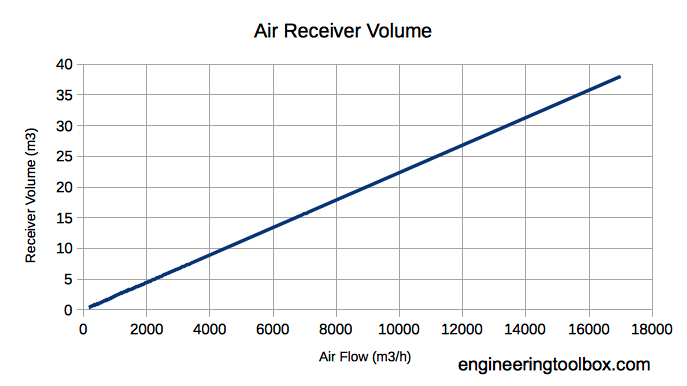 In practice it is common that the manufacturer use standardized receivers for specific compressor models based on their know-how. For calculating the receiver, note that it is necessary with a pressure band for the receiver to be effective. If the consumption process requires 100 psig (6.9 bar) and the compressor is set to 100 psig, there is no storage and no buffer. Any increased demand will make a pressure drop below 100 psig until the compressor responds by increasing the air volume compressed. If the compressors operates at 110 psig the difference between 110 psig and 100 psig accounts for the air stored in the receiver. If the demand increases, the pressure can drop 10 psig before the minimum requirement is met. Pressure and flow controllers can be used after the receiver for stabilizing downstream pressure to 100 psig and flattening demand peaks. Note that in a compressed air system the pipe work also makes the purpose of a buffered volume. Note! Receivers of unsound or questionable constructions may be very dangerous. Engineering ToolBox, (2005). Compressed Air Receivers. 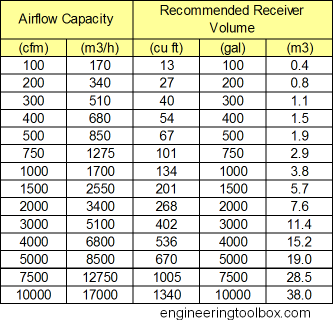 [online] Available at: https://www.engineeringtoolbox.com/compressed-air-receivers-d_846.html [Accessed Day Mo. Year].